You have 120 characters left. Do not use HTML. Already have an automation interface for X-10, UPB, Z-Wave or Insteon and want to try HAL? This is the least expensive way to begin automating your home with HAL. 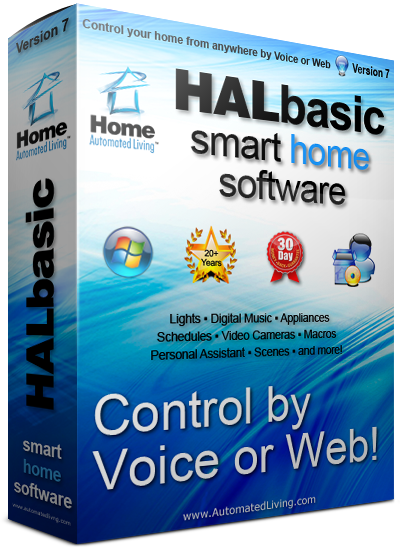 HALbasic 30 Day Trial is for new customers and gives you a full introduction to voice control of your home, voice control of HAL Internet Information, voice control of devices and appliances. If you don't have an automation interface for your PC, you may want to consider buying an interface or the complete HALdeluxe Introduction Kit. While still economical, the HALdeluxe Introduction Kit includes a UPB powerline adapter and lamp module so you can begin controlling lights as soon as you install the software! Whatever version you choose, HAL offers a complete upgrade program that credits prior purchases as you grow your HAL home control system. * Since HALbasic is a trial, you cannot not checkout using PayPal. Please use the regular checkout. * If the checkout information is incomplete or inaccurate, your trial order will NOT be processed. * HALbasic Trial orders are processed within 24 hours. Thank you for your patience. * Home Automated Living reserves the right to reject requests for this trial offer for any reason. * As mentioned above, HALbasic Trial is for new customers and is limited to one copy per customer/household.